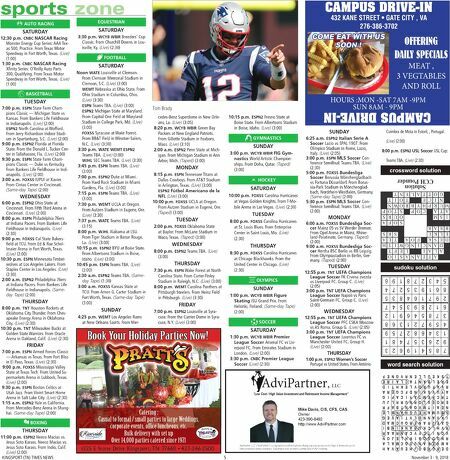 November 3 - 9, 2018 4 KINGSPORT (TN) TIMES NEWS 2 x 2" ad fabric etc. 2 x 2" ad a+ extractions 2 x 2" ad music masters 2 x 3.5" ad first comm. bank 2 x 2" ad gazebo party 2 x 2" ad la caretta 1 x 2" ad myers painting 1 x 2" ad houts hidden treasure 1 x 2" ad boutique on rose 1 x 2" ad egan design ACROSS 1. Annabelle of "Bull" 8. Jai __ 9. "__ Behind"; 2014 Nicolas Cage film 10. "__ __ the Stars" 14. Writing table 15. Actor Barrett 16. __ Leoni 17. Actress Sommer 18. Yrbk. section 19. Winnie the Pooh, for one 20. Davenport 24. Suffix for critic or skeptic 27. "Yours, Mine & __"; Dennis Quaid movie 28. "One Day __ __ Time" 29. "Beverly Hills __"; film for Eddie Murphy 32. "Non-__"; 2014 Liam Neeson movie 33. Candice Bergen series (2) 36. "The __ Guys"; 2016 Russell Crowe film 37. Stick __ __; re- main at a task 38. "America's __ __" DOWN 1. Setting for "Men in Trees" 2. Refueling ship 3. "__-Tac-Dough" 4. Seaweed 5. Stitch 6. "__ __ Tuesday, This Must Be Belgium"; 1969 film 7. Furry swimmer 8. Fred Astaire's danc- ing sister 11. "As __" (2001- 04) 12. "__ Time for Ser- geants" 13. "London __ Fall- en"; 2016 Gerard Butler movie 14. Messing, to friends 20. "...a ten o'clock scholar, what makes you come __ __?..." 21. Bamboozle 22. "All Quiet on the Western __"; Lew Ayres film 23. Cleopatra's downfall 24. "__ __ Number Four"; Alex Pettyfer movie 25. Got __; learned to avoid bees 26. Actor Van Pee- bles 29. Newsman Hunt- ley 30. "__ vey! 31. Initials for actor Boyle 34. 1/100: abbr. 35. Mailman's beat: abbr. The identity of the featured celebrity is found within the answers in the puzzle. In order to take the TV Challenge, unscramble the letters noted with asterisks within the puzzle. 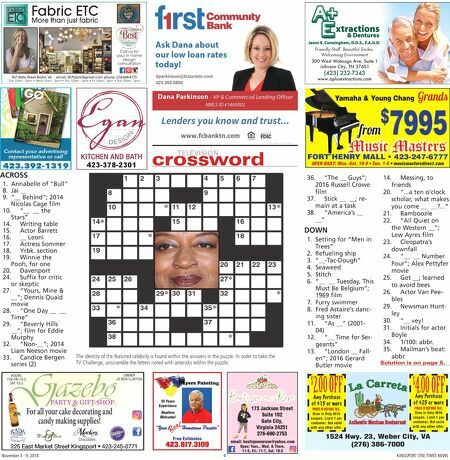 crossword Solution is on page 5. TELEVISION Decorator Fabrics & Accessories 507 State Street Bristol, VA 276-644-4775 Fabric ETC More than just fabric Call us for your in home design consultation 507 State Street Bristol, VA email: 507fabric@gmail.com phone: 276-644-4775 Tue 10am - 5pm • Wed 10am - 5pm • Thu 10am – 5pm • Fri 10am - 5pm • Sat 10am - 5pm FORT HENRY MALL • 423-247-6777 OPEN DAILY: Mon.-Sat. 10-9 • Sun. 1-6 • musicmastersdirect.com Yamaha & Young Chang Grands from $ 7995 173 Jackson Street Suite 102 Gate City, Virginia 24251 276-690-2753 email: boutiqueonrose@yahoo.com Open: Tues., Wed. & Thurs. 11-5, Fri. 11-7, Sat. 10-2 KITCHEN AND BATH 423-378-2301 dparkinson@fcbanktn.com 423.392.5800 225 East Market Street Kingsport • 423-245-0771 PARTY & GIFT SHOP HOURS: TUE-FRI 10-5 SAT 10-2 OWNER JO-RITA CLAYTON Chocolates For all your cake decorating and candy making supplies! "Your Hometown Painter" Free Estimates 423.817.3109 R e a l 35 Years Experience Realtors Welcome! 1524 Hwy. 23, Weber City, VA (276) 386-7000 $ 2.00 OFF $ 4.00 OFF Any Purchase of $15 or more Any Purchase of $25 or more PRICE IS BEFORE TAX. Dine in Only With coupon. Limit 1 per customer. Not valid with any other offer. PRICE IS BEFORE TAX. Dine in Only With coupon. Limit 1 per customer. Not valid with any other offer.